What do believers in Yeshua mean when they speak of Pentecost or Shavuot? The Feast of Pentecost was one of many important feasts instituted by God in the Old Testament. It took place fifty days after Passover, and because of this, it is sometimes called the Feast of Weeks (seven weeks). (Lev. 23:15-16) It is also called the Feast of the Harvest several times in Leviticus 23; this is one of the most revealing names of the Feast, because it speaks to the true purpose of the Feast: to give thanks to the Lord for the bountiful harvest that He blessed His people with. As a result of this mighty outpouring of the Holy Spirit, the church of the New Testament was born! 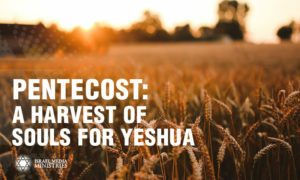 Believers in Yeshua sometimes focus on the gifts associated with this outpouring, but we must never lose sight of its focus: it was meant to be a harvest, a gathering of souls into the kingdom of God. Lest anyone should lose sight of that day’s true purpose, the Apostle Peter delivered a sermon where He declared, “And everyone who calls on the name of the Lord will be saved.” (Acts 2:21) Reading further, we see that after his message, three thousand believers put their faith in Yeshua! (Acts 2:41) Someone might read that and say, that was great sermon! But the truth is it was the Holy Spirit power behind the sermon that brought the harvest of souls! That was Pentecost in action! As we approach the holiday of Shavuot, let’s remind ourselves why we do what we do. We are not simply celebrating the holiday, but we have yielded ourselves as vessels of the Holy Spirit so that we can bring in the spiritual harvest which God has promised in the last days. The Feast of Pentecost, like all feasts in the Bible, is a type of a spiritual reality. While many people claim to understand the meaning of Passover, not everyone understands Pentecost. It’s all about the harvest, and I know you believe the harvest is important. We encourage you to partner with us as we work together to bring that harvest in.